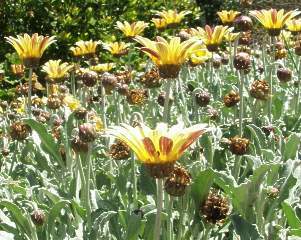 A tough and fast-growing groundcover often seen in gardens around the world, Arctotis stoechadifolia surprisingly only occurs naturally along a small strip from the Cape Peninsula to the West Coast. A sprawling perennial, the silver arctotis forms a striking silver-grey carpet that easily covers an area of about 1.2 m wide, with upright shoots and flowers standing about 350 mm high. The base of the plants become woody with age, but the long, spreading stems and leaves are soft, woolly and slightly sticky with a very strong bitter-sweet smell when touched. The white felted leaves are long and narrow (lance-shaped) with the edges slightly toothed or serrated. 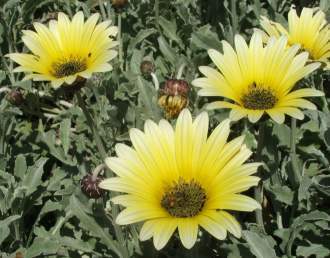 The showy flowers are large, single daisies with long, creamy to light yellow petals that are marked with red/maroon underneath. The centre of the flowers is black. Flowering for a few months from spring to summer (September-December), it creates quite a show with masses of flowers. Typical for Arctotis, the flowers only open with sunlight; the flowerheads curve down as they start to seed, only straightening up when the seed is ready to be blown away by the wind. The big, fluffy seeds ripen quickly within weeks after flowering and are easy to collect as they loosen and fall from the seed head. Arctotis stoechadifolia is not considered rare or threatened at present, but its natural distribution is limited to a very small area along the West Coast that is under increasing pressure from urban development. In California and Southern Australia where Arctotis stoechadifolia is often planted in gardens or as a coastal sand-stabilizing plant, it is starting to become a weed as it invades natural areas. 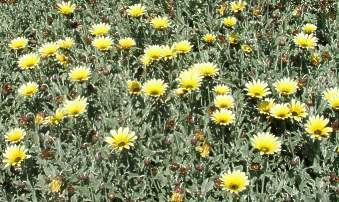 This is a problem, as it smothers and eliminates the indigenous plants through shading and competition of resources, which again result in a loss of biodiversity, as large areas are covered only by Arctotis stoechadifolia. 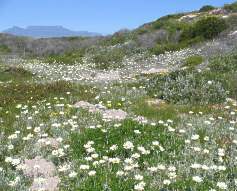 Arctotis stoechadifolia occurs naturally on the dunes and sandy flats, mostly along the coast from Langebaan to the Cape Peninsula. Along this narrow distribution range, it is quite common and very vigorous, with beautiful plants and spring displays especially along the coastal strip between Bloubergstrand and Melkbosstrand. Very adaptable, Arctotis stoechadifolia manages to thrive in the harsh coastal conditions with hot dry summers, sandy conditions, strong winds, salt spray and low winter rainfall (500mm and less in this area). The genus Arctotis was named by Linnaeus and means the following in Greek: arctos, a bear, - otis, ear, and refers to the scales on the pappus (fine hairs on the fruit that aid in wind dispersal) that look like ears. The reason for the species name stoechadifolia is not clear, but stoechas or stoichas in Greek refers to a kind of mint (Brown 1956); stoechas could also mean, of the Stoechades (now the Iles d'Hyeres) off the south coast of France (Hyam & Pankhurst 1995). An African genus, Arctotis has about 50 species that occur from southern Africa to Angola. The species of Arctotis are very difficult to characterize ( Harvey 1865), which makes the identification of the different species very difficult, especially as there is no recent revision of the genus, plus and there are many natural and man-made hybrids. Plants are pollinated by bees that frequently visit the flowers during the day. Arctotis species and hybrids are very popular garden plants across the world as they are easy to grow and very floriferous, with large flowers in a range of colours. Flowering for a few months, Arctotis stoechadifolia can by used in endless combinations as the seasons change. At Kirstenbosch it is one of the most striking plantings in spring, hanging down a stone wall in front of a large spring annual bed filled with A. acaulis and Ursinia speciosa. In early summer it looks spectacular as a groundcover, flowering with the bright yellow Wachendorfia paniculata (bloodroot) and the annual Oncosiphon grandiflora ( stinkkruid ). In coastal gardens this is one of the best groundcovers to retain the sand cover. Cultivation Arctotis stoechadifolia is easy to grow but must be planted in full sun and soil with good drainage. Adapted to the Mediterranean climate of the Cape, it can survive with very little water in summer after the winter rains. Plants need to be protected from frost, but should resprout after frost damage. Propagation Most of the Arctotis plants at Kirstenbosch are grown by cuttings made throughout the year. Tip cuttings taken from a healthy growing stem root easily and are placed in a tray filled with well-drained sand. The rooted cuttings are grown on in bags before planted into the garden, but could be planted directly into the garden beds especially during the cooler winter months. Seeds should be sown in seed trays during autumn and planted into small pots to be grown on as soon as they are a size that are easy to handle. Black, hairy worms attack plants in the garden and nursery, but it is not necessary to spray as they seldom do serious damage and the tough plants resprout vigorously. Brown, R.W. 1956. Composition of scientific words. Smithsonian Books, Washington. Germishuizen, G. & Meyer, N.L. (eds). 2003. Plants of Southern Africa : an annotated chaklist. Strelitzia 14. National Botanical Institute, Pretoria. Goldblatt, P. & Manning, J. 1996. West Coast. South African Wild Flower Guide 7. Botanical Society of South Afirca, Cape Town. Goldblatt, P. & Manning, J. 2000. Wildflowers of the fairest Cape. ABC Press; Cape Town. Hyam, R. & Pankhurst, R. 1995. Plants and their names: a concise dictionary. Oxford University Press, New York. Smith, T. 2003. Guide to plant genera of southwestern Cape. University of Cape Town.